Stay organized in your business and save money. When owning your own business, you will definitely want to be organized in your efforts to succeed online! There are many ways to be organized, you will have to find out what works best for you. What I like to use is Microsoft Outlook. It organizes all your contacts for you. You are also able to keep your calendar organized and your to-do-list organized. This is important and it comes with the Microsoft Office Suite you get with Word, Excel, and Outlook all in one. Plus you can link your e-mail account to it so it becomes your one-stop office suite that if you are like me, you'll use it for everything. Whenever I get a prospect online I immediately put them into their respective auto responder. If the prospect inputs their phone number, then I'll give them a call as soon as I can and then I'll input their information and the notes I take from that prospect into Microsoft Outlook's calendar. This is important, so I remember when to follow up with that prospect and also to see if the prospect is even worth following up with or not. 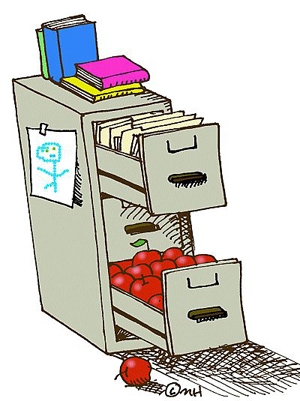 I would also recommend getting a filing cabinet to keep track of important documents you get through your business endeavors. The most important thing to use this filing cabinet for is to keep the receipts you get from buying things for you business. Every business has business expenses. You need to keep track of your income and expenses for IRS purposes! I pay for 2,000 unique paid to click visits from an advertising site that costs me $12.50 total. If you don't at least make your $12.50 back that you spent; I don't recommend advertising with that site again, or you might need to make some more adjustments to your site to make it more profitable. Remember, you always want to be increasing revenue from your website. I also recommend only doing one paid ad at a time. This way, even without tracking the clicks, you'll be able to really see what kind of results you get back from the advertising first hand. If you decide to do more than one paid ad at a time, just add the total expenses from both of them and attempt to beat that expense. Another good point for staying organized is to set up a budget for your advertising expenses. It's easy sometimes to over spend. So set up a monthly budget of only $50.00 to $100.00/mo in paid advertising to your site on top of all the free advertising you are getting from other sites. If you make a return on that investment, then by all means you know what you are doing and can spend more as long as you are in profit. Another recommended thing is to open up a business account for your online business after you get your business name registered. To get your business name registered you just need to go to your State of residence and pay a small fee to register it. Business accounts are easy to open up and a basic account costs nothing once you have your business name registered in your local State. To save you money in faxing expenses. I found the cheapest thing out there. You don't even need a fax machine and it only cost a minimum of one dollar a month! I have been using Faxaway for a couple of years now and it rocks. You just scan what you need to fax to people and it's e-mailed to the receiving end. It's that easy. Some tips on keeping your business organized by using Microsoft Outlook and keepting track of every penny that goes in and out of your business.